Last March (2015) I decided to upgrade from Creator10 to NXT3. In June (2015), I upgraded to Win10. It quickly became obvious that there was a compatibility issue. I checked online and discovered that the issue was not unique. I contacted CS, they had me uninstall/reinstall, download a fresh version, download an uninstaller which worked no better. THEY HAD ME WASTE HOURS AND HOURS doing all this crap. IN THE END, THEY ADMITTED THAT THEY WERE AWARE THAT THERE WAS AN ISSUE. The solution I was given today when I requested a free upgrade was NO. I could purchase the program at a discount from their website. Thanks Roxio for a total waste of time and money, this is no way to treat customers. You upgraded your OS to Windows 10 and NXT3 isn't W-10 compatible. You chose to upgrade to Windows 10 and that move rendered NXT3 worthless in W-10. NXT4 is W-10 compatible why they told you "you could purchase the program at a discount from their website." If you called Roxio tech support BEFORE upgrading to W-10 you would of known you where updating yourself out of your present NXT3 Roxio Software, so who's fault is that? Funny, how this is the only program I have had an issue with. Funny, how CS/Tech Support did NOT tell me it was not compatible until haveing me go through all sorts of gymnastics to get it to work. We spent WEEKS going through different processes. They were not aware of the issue. Funny, that CREATOR10, which I have gone back to is working just fine under Win10. Yes, you can blame me, but if I use your logic I should call every company about their programs before doing an OS upgrade. And in the end, CS/tech Support would have given me the wrong answer anyway. How can a company today make a software that would be compatible with a future Microsoft Windows 11 operating system? News to me that Creator 10 would work under W10 ???? What version number of Creator 10 do you have ? Easy Media Creator 10 or Roxio Creator 2010? 1- Beta testing is done. And I believe MSft works with developers for compatibility. 2- Non-compatibility can always be an issue, and programs do become obsoleted. 3- They were selling this product, I believe even after the Win10 roll out. I happened to purchase it about 3 months before the Win 10 rollout. 4- Tech Support worked with me FOR WEEKS trying to get it to work. THEY WERE NOT AWARE THAT THERE WAS A PROBLEM. 5- I mentioned that I had seen online others had issues with Win10, they claimed to know nothing of these reports. I am not sure that NXT 3 is not compatible. Often ONE individual in a support site relays a false conclusion. If that were true, we wold have expected to see a note from Roxio here by now. I installed Creator 2011 After I installed Win10 and it "worked" but I did not do a through test of it. You need to go to Help, About This Software. Post the Version and Build #. EMC Easy Media Creator 10 isn't even Vista Compatible does it work in W-10? For some reason I could not copy and paste. 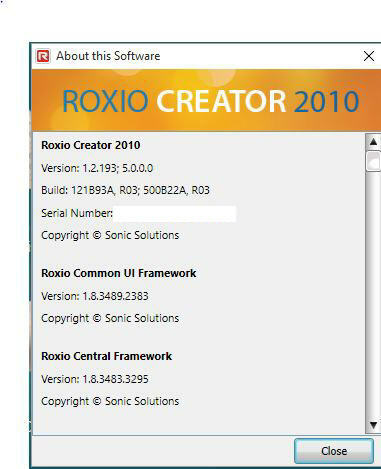 Roxio Creator 2010 (which you suggested you are running) is NOT compatible with the new Windows 10 OS ! Could it be that you are running it with an earlier version of Windows OS ? 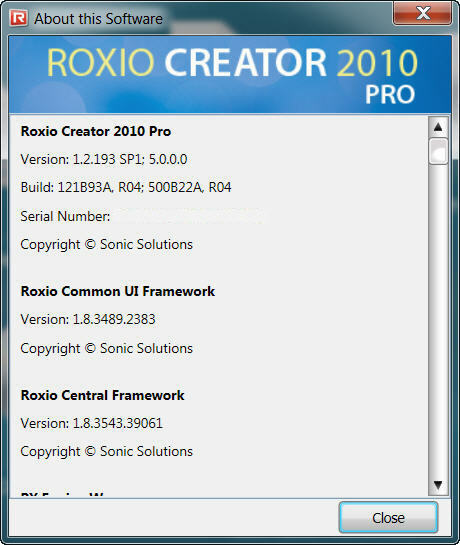 They also are all running Roxio Creator 10 with no issues. 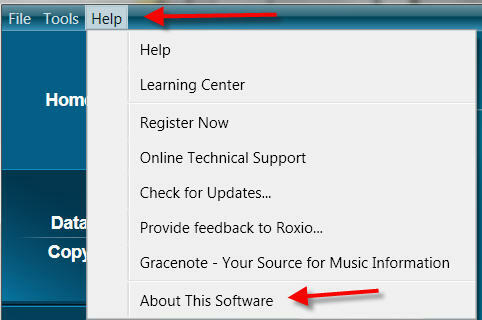 2--On the top menu click on the help (tab) then on "about this software"
4--In the search box enter "snipping Tool"
7--Now use you mouse cursor to place a square box around the "about This Software" for 2010. 8--Now click on "Save-As" and save it to your desktop in W10. This will become a jpg photo of that screen named "capture.jpg" unless you give it a different name. Now, on your post replies for your problem, add this jpg you just captured to your reply by clicking on "More Reply options"
click on add this to your reply. Now we will all get to see exactly what you are seeing for the version of your Creator 2010 ver. Hope this helps you in screen capturing most anything you can see on your monitor. R03 might be the standard version instead of Pro? Or SP1 isn't installed on his version? Edited to remove CD Key! Sorry I'm late to this discussion. I'm the southernmost guru and in a different time zone. Working my way through the puppy-pile here I see that you had problems with NXT 3 when you went to Windows 10, so you went back to Creator 2010 and that seems to be working for you. Can you tell me please, what was your problem with NXT 3? It should be compatible with Windows 10, and I have it apparently working fine under that O.S. would you tell me what that issue was, please? NXT 3 is listed as "Windows 10 Ready" on the Corel site here, so it is supposed to be compatible with Windows 10. Did Corel Support say what this issue that they were aware of was? They haven't told us users about any known issues between NXT 3 and Windows 10 generally, and I haven't seen any mentioned on the board until now so any information you can give on that might point a direction for us to look. Since most of us haven't encountered such a problem I wonder if it could be related to the Windows 10 drivers for some particular item of your hardware? In the meantime, unless they've known of this "issue" for a long time I don't imagine it will have been corrected in NXT 4. So your best bet is to keep on using Creator 2010 for now, as long as it keeps working for you. My experience with Tech Support is pretty much listed above. We exchanged emails for several weeks, none of their ideas worked. The agent finally said this was a known issue. Yes, I've waded through minute uninstalls - I feel your pain. I think your outcome is quite unsatisfactory but I have no way to fix it. I wish I could do more. bits and parts left over that are in the Registry. I'm not suggesting you go back and start all that stuff again if you have Creator 2010 working happily, but did they get you to try a CleanSystem.bat file, Elliot ? That does not ring a bell, so I'll say no. But I'm done with NXT3, Creator10 is working just fine. Yes, we're poking the wreckage and murmuring "I wonder if it was this . . . "